"Chocolate and bananas, two great tastes that go together!" Preheat oven to 425 degrees F (220 degrees C). Lightly grease a 12-cup muffin tin. In a medium bowl blend the banana, oil, egg and vanilla together. In a large bowl, combine the flour, sugar, cocoa, baking powder and salt. Stir in the banana mixture until just blended. Fold in the chocolate chips. Spoon the batter into the prepared muffin tin, filling 3/4 full. Bake in the preheated oven for 15 to 20 minutes. Remove muffins to a wire rack to cool completely. 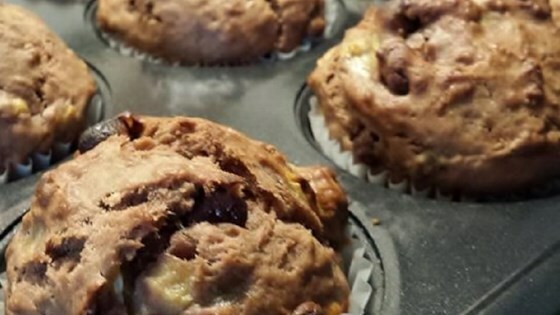 These muffins were very tasty and easy to make. I halved the amount of oil, though and used half applesauce. They were very moist! i found my batter to be a bit dry when it was all mixed together, so i added 1/2 cup + 2 tablespoons of plain yogurt and then was able to get the right consistency of batter. turned out great! These are delicious and very easy! I was a little bit low on banana, so I added about a half cup of applesauce and they were great. My five-year old thinks they're the best ever.